Varanasi is considered one of the most spritual places in India. 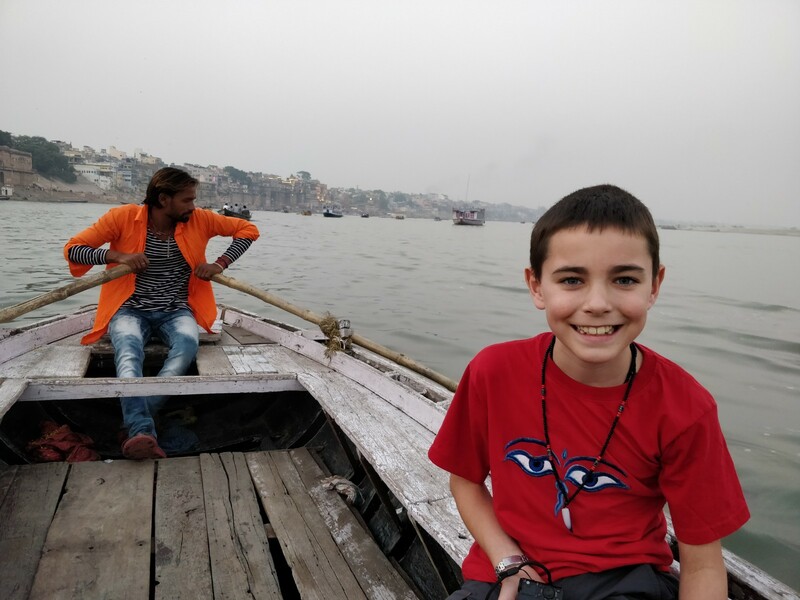 It is a must-see place, even just to experience it once and to see Varanasi with the kids is very special. The city itself is loud, vibrant and full of colour… so we thought we’d go one better and during Diwali – the festival of light. All I can say is Wow! It was a complete onslaught of our senses!! But in all honesty it wasn’t one of my favourite places. That being said, it was one of Keith’s! In my defence I was sick during our time there and so was generally not feeling the love. We ended up staying for 6 days in total. Due to it being the holiday season the trains were all fully booked. So in fact we stayed longer than we would have intended. 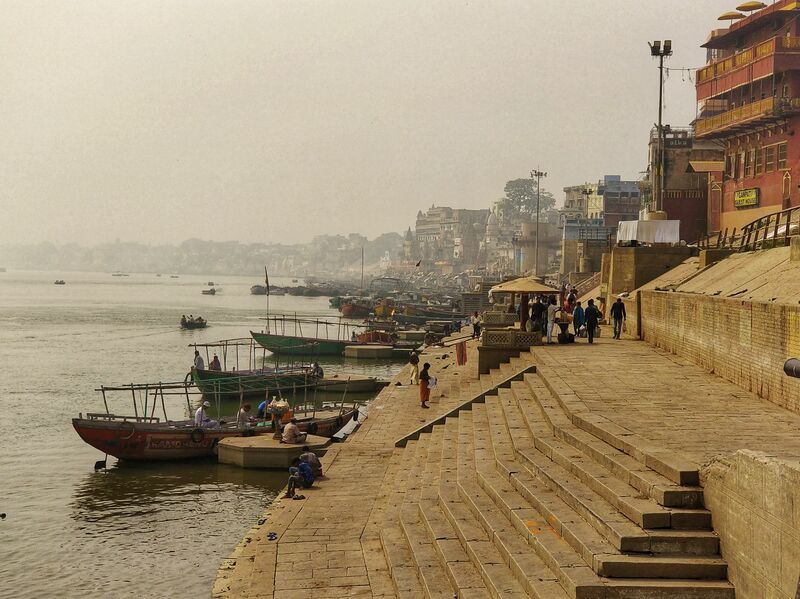 Saying that, Varanasi is a place like no other and definitely an experience I will remember in India. Day 1 – people spring clean their homes and shop for new kitchen utensils. Day 3 – is the main day of the festival when families gather together having feasts and firework festivities. Day 4 – is when is when family bring gifts and best wishes for the season. A bit like we do at Christmas. Day 5 – the last day of Diwali, brothers visit their married sisters who welcome them with love and a lavish meal. The only way to explore is to walk – it’s quite challenging to negotiate the narrow alleyways around Varanasi. Most of the guesthouses are situated down these streets, which are shared with cows, dogs, scooters and people – lots and lots of people! Plus the odd firecracker or two! At times it felt as if we were in the middle of a war! The boys were a little nervous about this to start, but soon got used to it… Except for the cows. They didn’t life the cows – especially with big horns!! The area is tightly compact and so makes it a squeeze to get around. However, once you reach the Ghats there is an air of calmness. The ghats are steps which lead down to the river. and there is a walkway which runs the length of the town from Assi Ghats to Dasawamedh Ghats. It’s a long walk and can get quite hot during the afternoon as there is no shade. I found Assi Ghat to be quieter too, unlike the main Dasawamedh Ghat, which was near to where our accommodation was. Every night a ceremony is held at Dasawamedh Ghat. The ceremony would starts 6pm until around 7pm in the evening and lasts around 45 minutes. If you want to have a good spot then you need to arrive early. But we never found it difficult to find a place to watch. 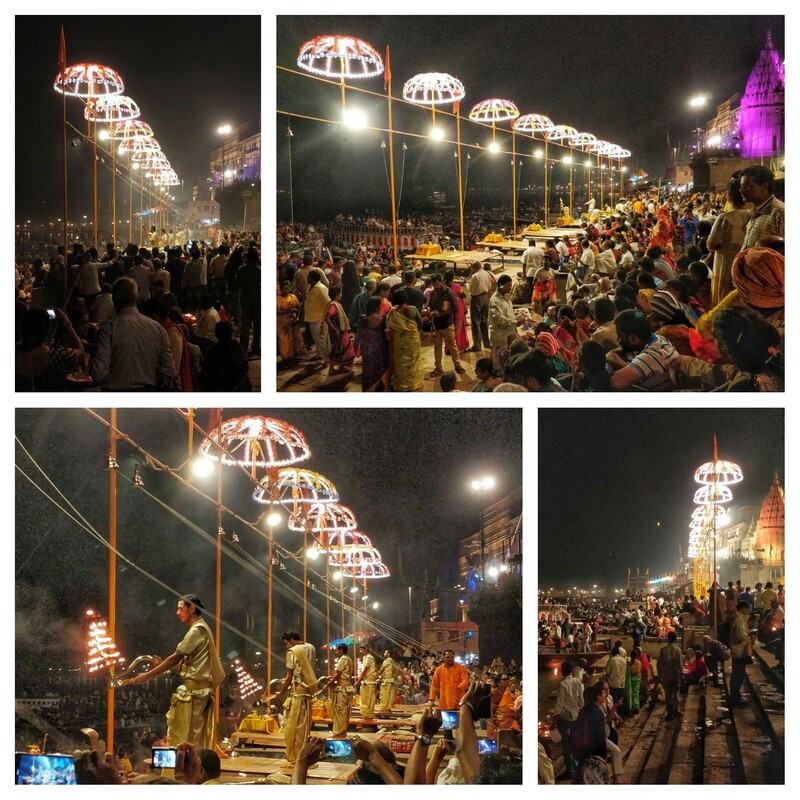 It is a very busy and noisy affair – standard in Varanasi; the kids loved it! There is a platform where the ritual is performed, watched by hundreds of people (and their phones!). It was amazing to watch but did go on for a long time. There are a couple of restaurants which overlook this area and is an option if you prefer to have a comfortable seat instead. The Burning Ghats are fascinating and a completely different perspective on how we view death at home. 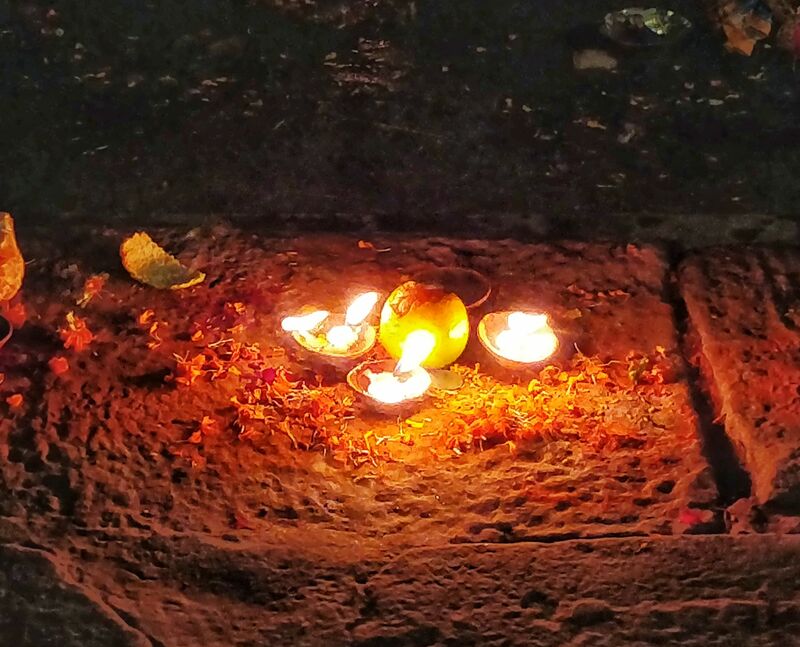 Indian families save all their lives to ensure they have enough money so that upon their death they are submerged into the River Ganges before being placed on an altar and cremated. The whole process is on full view of anyone who walks by. But photographs are strictly prohibited and frowned upon. This is a sacred place and should be respected as such. But to see it all happening and to actually see a dead body was a little bit crazy. It did take some getting used to. The boys saw the bodies being cremated and we explained to them what was happening. They weren’t squeamish or revolted by it. They were actually quite intruiged and asked lots of sensible questions. From the minute you step foot on the Ghats you will be asked if you want a boat trips along the River Ganges. The most popular boat tour is a sunset tour. There are plenty of options and plenty of boats, but it would be easier to organise a trip through your accommodation. We booked a trip which departed at 4pm. First it went across the ganges towards the other bank, then travelled towards Assi Ghat. We didn’t reach the whole way as rowing looked like hard work – even for our Miami vice look-a-like. As the night sky darkened we head towards the Burning Ghats. Although it is frowned upon to take pictures while you are at the Ghats there was no such restrictions while you row past. They are quite a sight to see! Most boat trips are around 3 hours. We had the option to start later and to watch the ceremony from the water, which is considered a better view. However, we’d already seen the ceremony and so were happy enough to just head back. 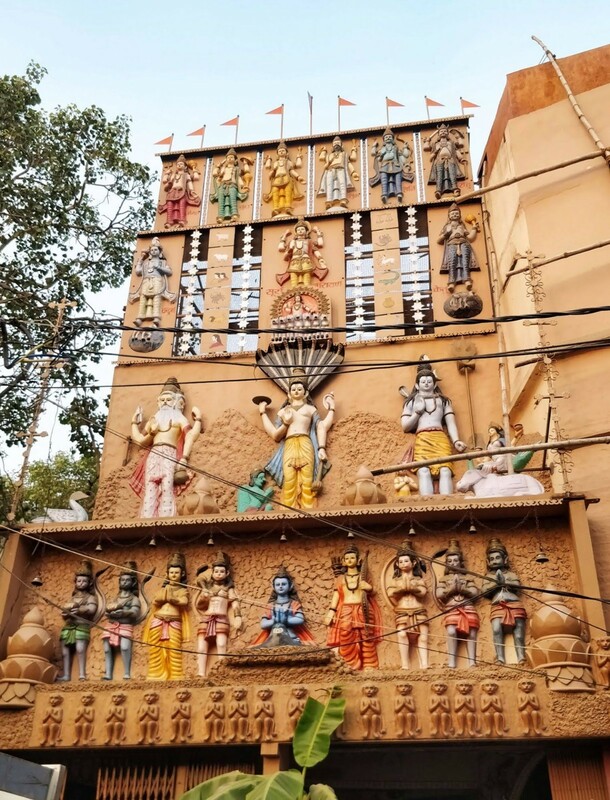 This is the one of the most religious temples in Varanasi for Hindu’s. 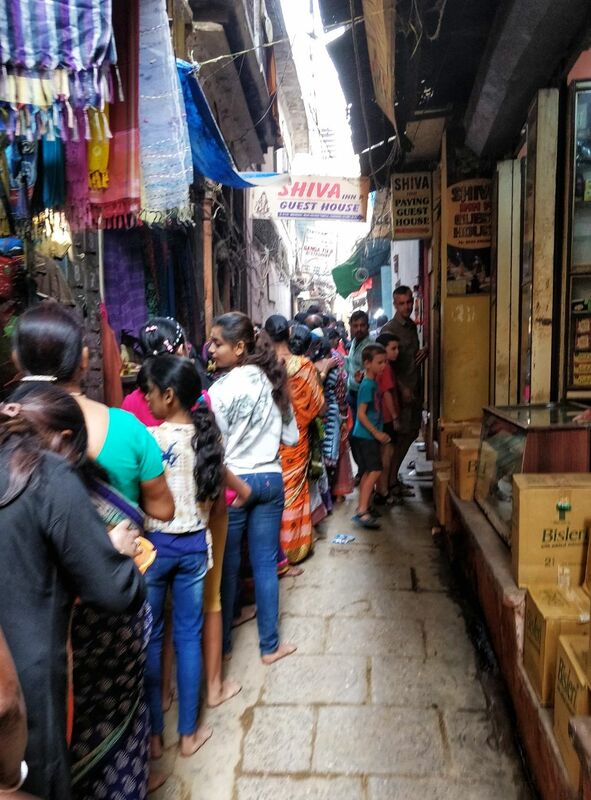 Many people from India travel here every day….hence the huge queues we saw every day. I get the impression this isn’t really for tourists and so we didn’t visit (although you can if you want). There are rules about no electronics in the temple (including watches) but there are lockers outside the temple. Although this is the ‘main’ temple there are lots of smaller temples dotted around the alleyways and that’s. We enjoyed strolling around and finding the hidden doorways. We stayed at Shiva Inn paying guesthouse. The owner was a rather enthusiastic gentleman who had a wealth of information – probably too much as you were expected to listen whether you liked it or not. We had our boat tour & train transfers arranged through him, but it was sometimes a little too insistent. He wasn’t a bad soul, just a bit too eager for us as we tend to like to be left to our own devices without being barraged with 50 questions. The room we had was a large, spacious and clean room. Unfortunately I was not well during my stay here so it helped to have somewhere comfortable to relax in. The hostel was situated close to the main ghats. Most days (especially during Diwali) there would be a queue heading to the golden temple stretching right past our door. It was a bit crazy down the back streets of Varanasi. 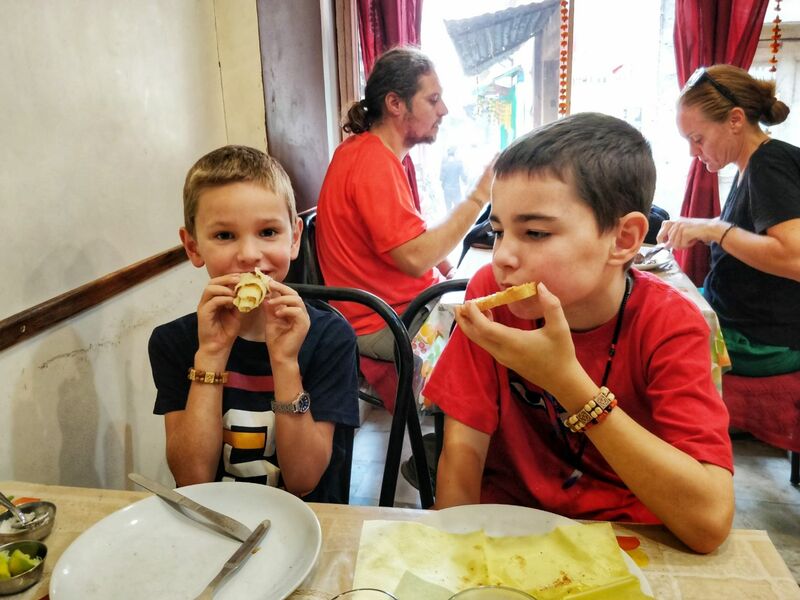 Dosa cafe – very small place and great if you love a dosa. It had every conceivable type of dosa (and ones you wouldn’t expect! ), but also served Idli’s and Uttapam. We ordered some nice lassis in here! It doesn’t open until 10am and only has a handful of tables. It was ok, but seems a bit limiting, especially with kids. Niyati cafe – only a small place with a handful of tables. Opens around 9am – 9.30am! Nowhere is up early on Varanasi, it seems! We tended to come here for breakfast most days. They did fabulous pancakes and we loved the toast with peanut butter! Simple but exquisite. Their coffee wasn’t great, but they made nice lassi’s. Shree cafe vegetarian restaurant – situated close to Dashashwamedh ghat. It was very cheap and good food option. We ate here a handful of times and the service was always quick and food nice. The boys particularly enjoyed the Veg fried rice here. We actually visited here twice as the price was very reasonable and food tasted good. We ordered a few Indian vegetarian dishes. 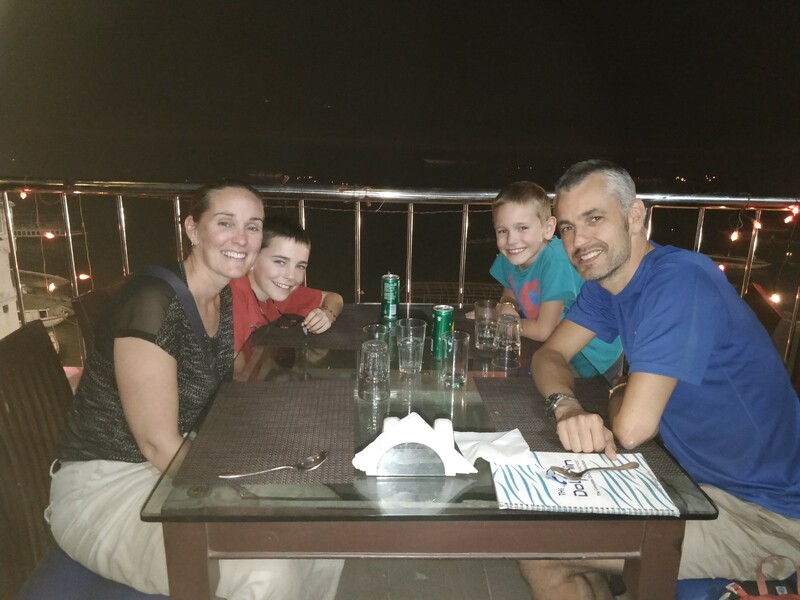 Dolphin restaurant – we decided, as we were started to feel better, that it would be nice to have a beer one night. As Varanasi is a religious town alcohol is not served, but there are a handful of places that you can buy it. This restaurant being one of them. It was almost in hushed tones that we were offered one and on the bill it was listed as a ‘soft drink’. But for Rs 500 per bottle you had better be desperate as that was one expensive beer!!! The food served here was Indian and International but was fairly average. The price was higher than we are used to paying but it did have a nice view over the River Ganges. Brown bread bakery – this offered an all you can eat breakfast buffet. However, there was very little guidance offered and it was unclear what was available and where you got it, especially as we ordered other meals too which confused things. It was nice to have a range of soft breads. Generally the food was ok, but it wasn’t anything special. Spicy bites – a good selection of Indian and international cuisine. The food and price were reasonable, but they had decent coffee… hence why we went back a couple of a times! You’ll find number of places to eat around this area. You certainly won’t go short of food! 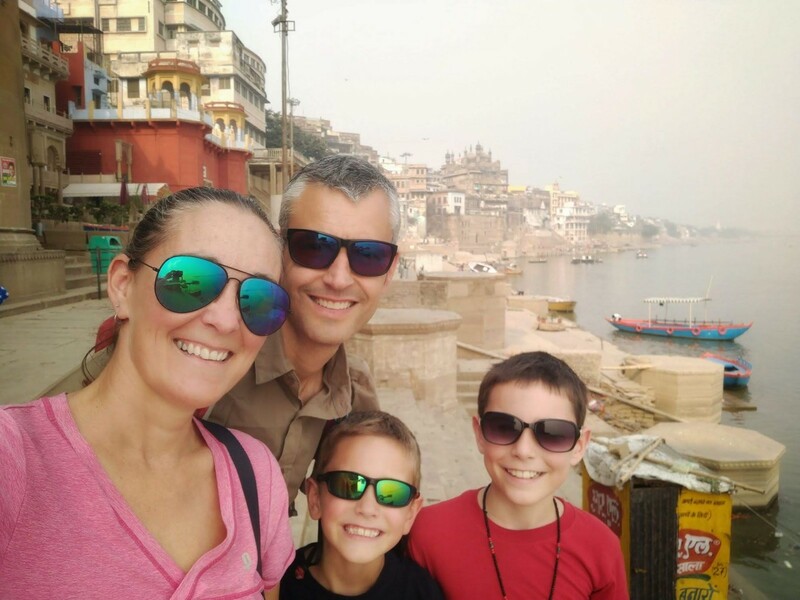 Varanasi is without doubt a must-see destination in India, namely because I can’t find the right words to describe it to you. Keith absolute loved its mayhem and whilst I enjoy aspects of this I was ill during our stay and so may be the reason for my less than enthusiastic warmth to the place. There were so many people and noises that I found it all got a bit too much at times. Don’t get me wrong it was great to experience it, especially during Diwali, but we had 6 days in the area – which was a little too long for me. Even the kids were less than enthusiastic about going out some days. I think I expected more calmness for such a spiritual place. But for the most part it wasn’t a place which offered peace and serenity. Maybe this was due to the location we were staying as the Assi Ghat area did appear to be much quieter. And the fireworks and firecrackers of Diwali didn’t help with the noise levels. However, it’s definitely one of these places which should be seen to be believed.